The reception is open from 10.00 a.m. to 18.00 p.m. Check-in starts at 14.00 p.m. The room has a small locker so if you bring a computer with you, it would be impossible to save it there! It was perfect lacation and the rest was quite okey. Al no ser un albergue joven, nos mezclaron con gente bastante adulta y la primera noche fue horrible porque había dos hombres que roncaban como si se fuesen a tragar todo lo que había en el cuarto, fue imposible dormir, además que a las 5 de la mañana hablaban por teléfono. Encima por la mañana, nosotros durmiendo y ellos encendiendo las luces y hablando alto. Por ello, hablamos con el encargado y nos cambiaron de habitación, fue muy amable y simpático. 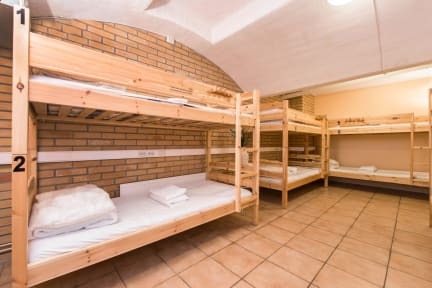 El hostal está muy bien. You pay more tan what you expected. We were supoused to pay 11'48 per person and we ended up paying almost 20€ each. They don't give you the possibility to decide wether if you want to use their bed clothes or not. La persona que nos atendió era bastante desagradable. No nos avisaron qu nos cobrarian las mantas al llegar no nos diron la opción de elegir con lo que se nos efecto el cargo directamente. 10 euros por persona. You have to pay extra for the linens.. and make your own bed.. the room had no windows and felt very weird. Showers are very dirty and bathrooms smell bad. However the guy in reception was nice. He answered my email pretty quickly. Without kitchen and bad service. This hostel is like a cave. I slept in a room without window at all. So there was no natural light and no natural air. Suciedad, falta de seguridad y personas extrañas.